Harold Scott Westerman died December 29th in 2011. He wrote his own obituary, which follows with only minor modification by his children. His history is available on this site as a web version of his book “The Kansas Kid” combined with the Paternal Ancestors page. A memorial service will be organized for summer 2012, and details will posted here. 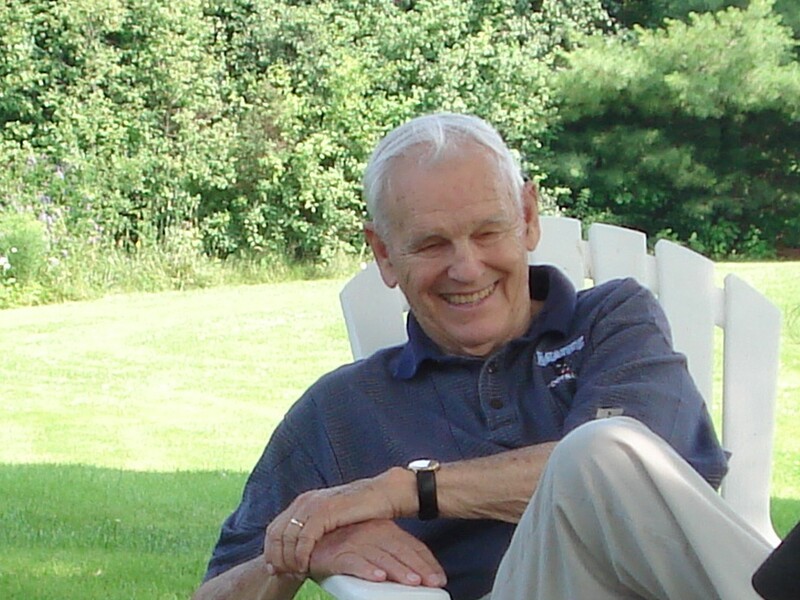 Harold Scott “Westy” Westerman died December 29, 2011 of natural causes at his residence in Dirigo Pines Village in Orono, Me. He was born to Harold L. and Elizabeth S. Westerman in Ann Arbor Michigan, December 21, 1917. He is survived by his four children Sandra J. Westerman, Pamela K. Tavelli, David S. Westerman and Gary S. Westerman, and by 12 grandchildren, 14 great-grandchildren, and one great-great-granddaughter. Westy spent his early years as a farm boy in Kansas and Colorado. After losing his mother at the age of eleven, the family moved to Adrian, Michigan, into the former home of his parents. He graduated from Adrian High School in 1936, then from the University of Michigan in 1946. He engaged in graduate studies at Hillsdale College where he coached football and basketball. In 1949 Westy accepted a position of assistant football coach with Dave Nelson at the University of Maine Orono. Then in 1951 he was appointed head football coach and later athletic director, serving until his retirement in 1982. Along with the University position, Westy and his wife Shirley owned and operated Wavus Camps, a private children’s camp of 200 boys and girls on Damariscotta Lake in Jefferson, Maine. Dad was enthralled with the Grand Canyon, starting the first time he saw it at age 17 while driving in a tandem car convoy from Detroit to Los Angeles to deliver new cars. This header photo is from the Spring 2010 geology department field trip, looking out over the Little Grand Canyon. It was a classic contrast, with native American flea market-style tables and booths of trinkets and crafts under ratty covers, all in a big dirt parking lot, versus the real Grand Canyon a few miles down the road with squeaky clean pastel pants and outlet store outfits in high end shops. Same rocks. Few have been able to touch so many lives in such a positive way for so many years. Rest in peace, Westy. Westy leaves a great legacy after a very long life. He impacted many people and set many standards. He had a great sense of humor and was always ready for the adventures ahead. The best to the families during this time. Greetings to all the Westermans and my condolences for the loss of your Father. Westy was an inspiration to me during my time at Wavus ( ’63-64 camper; ’65-67 counselor ): knowledgeable, wise, a true leader. And the better I got to know him as a counselor, whether during counselor meetings or just visiting around and about camp during night patrol, the stronger that inspiration became. Especially for me, his true-blue support of my Brother in his time of troubles ( as Cathy has noted above ) is a blessing I will keep in my heart forever. I attended the Wavus Camps from 68-70 and had the great honor of knowing Harold Westerman. Westy was an outstanding individual in every sense of the word. He was a natural leader, had very high standards and was an exceptional athlete. He was also a really great guy and admired by all. My Wavus experience has greatly contributed to my life. Camp introduced me to many new things that have stayed with me throughout the years. I have had the good fortune to meet many great individuals and Harold Westerman is one of the best. I will always remember him.